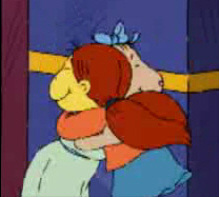 When Muffy said that, I laughed. Man Muffy is just setting herself up to be told off one of these days. I also finally saw "The Best Day Ever" yesterday. It was the only S16 episode I haven't seen in full yet and it's still not on YouTube. I wondered how they were going to work around showing clips in the 4:3 aspect ratio. At first, I only saw the opening posted on PBS's YouTube and those flashback clips were shown on a TV, so they got away with showing those in their original form. It turns out they shrunk the clips a bit and surrounded them with white clouds. I hated how they added some brief new "clips" to the flashbacks which meant going from the old animation to Flash, especially the clip of "The Return of the King". It shows Arthur pulling out the sword and the celebrations, and then it shows Flash Ratburn handing Flash Arthur a graded history quiz (still on the fairgrounds), motion tweens and all. 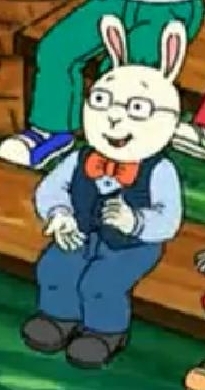 Did anyone ever notice how Flash Ratburn's fur is much more gray than previous seasons, and his clothes are less bright? His old coloring was way better. I wish the episode was on YouTube so we could compare the dubs, but if I'm right, the only clips that were not dubbed were Arthur and Buster's goodbyes from "Arthur's Faraway Friend" and George in the original "Arthur's Dummy Disaster" clips, though Arthur was still dubbed and there was a new scene animated in Flash using George's current voice. Also, during the flashback of D.W.'s constant accusing of Arthur stealing the snowball, the clip from "D.W.'s Snow Mystery" mostly used D.W.'s original voice. The gasp at the start of the montage and "I want a confession!" and the first "Confess!" was the original audio, but the other lines and the second and third yells of "Confess!" were dubbed. And what episodes were the other clips in the montage from anyway? I'm getting annoyed at the "clouds come in fast on a supposedly-great day, lightning flash, suddenly starts pouring" trope happening in a lot of Arthur episodes, and that their only concern is getting wet even though one should be much more concerned about being struck by lightning. I wish rainy days in Elwood City could be more like the end of "Buster Spaces Out" most of the time. Did anyone else notice that Mei Lin's crying sounds were changed? "Big Brother Binky" used the typical "Kate cries", but "Best Day" used new baby SFX. Were the "Kate cries" even used in S16 at all yet? The most recent use of them I can remember is "Through the Looking Glasses" (when Kate visualizes Arthur's head as a toaster). "Arthur's Baby / D.W.'s Baby" also used different baby SFX, but I'm pretty sure episodes after that used the usual ones (especially "Arthur's Lost Dog"), and "Arthur's Eyes" used them for 3-year-old D.W.
Wally was dubbed too, but you're right, when George finally read his poem, it was the original recording. Also still not impressed with all the dubbing in the flashbacks, but I somehow missed something the first time around: George's flashback included an entirely new sequence that wasn't originally in "Arthur's Dummy Disaster", where he had ducked behind a display of books, and Wally is now completely dismembered, carrying on like he's dying, and requesting one last drink of furniture polish before he goes. I'm with you on this one. I didn't even notice the added flash animation with George's flashback. Guess it's time for me to go through season 1 on YouTube to refresh myself on the oldies lol. So what required a redub, and what didn't with the flashbacks? That's what I want to know. Seems silly to mix old and new voices. I do think that George's current voice is actually quite similar to his original voice. 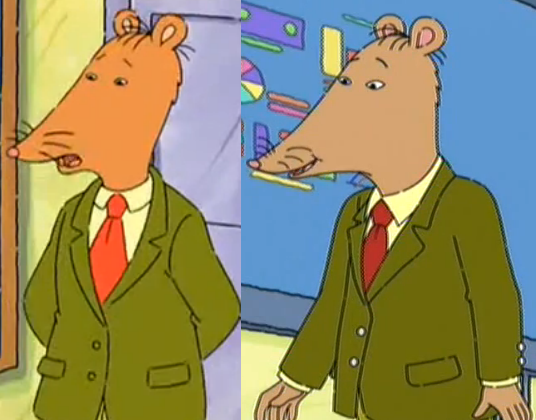 Did anyone ever notice how Flash Ratburn's fur is much more gray than previous seasons, and his clothes are less bright? His old coloring was way better. 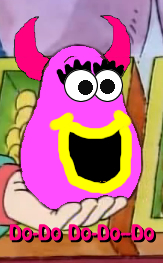 I thought something was strange about Ratburn this season, but I couldn't quite pinpoint what it was. You nailed it though, and it IS much better the old way. Here's a comparison of "Traditional" and "Flash" Ratburn (from "Through the Looking Glasses" and "Get Smart", respectively). If anyone wants me to do this for other characters, let me know. I'm guessing since older episodes are rarely seen anymore, they probably didn't want to confuse the little kids watching as to why their voices "suddenly" sound very different in the flashbacks. Poor Mr. Ratburn, he's getting old. I just cannot fathom the flash animation - the older drawn animation suited the style much better in my view. The flash animated characters look too stiff in my eyes. I'm not going to slam flash animation as a whole - it works for other cartoons, just not Arthur in my opinion. I do suppose kids growing up on the "new" Arthur could care less and may enjoy the newer seasons. If they enjoy it, that's fine for them. I like the idea of comparing character shots. I'd use Season 7 as a base; that's when the animation looked its best, IMO. As I said before, watching the "It's Only Rock 'n Roll" special makes me depressed because the animation will probably never look that good again. It's ahead of the 3D movie and Season 16 by miles. Sorry to jump this topic back to "So Funny I Forgot To Laugh," but I just saw a scene that made me realize that Sue Ellen is probably the biggest hypocrite in the entire show. 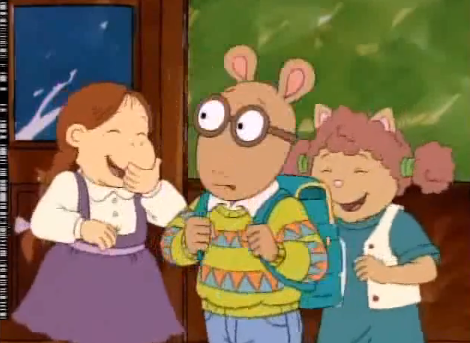 Also, notice that Muffy is laughing as well. I know that the artists and writers are not superhuman and can't remember everything, but this is a good reason why you don't mess with a character's personality for a single episode. Wow, I'm usually pretty good with identifying episodes, but I'm drawing a blank on this one. Which episode is this from?? It's "Meek For A Week." Unless Sue Ellen spent the remainder of the episode making fun of Arthur's sweater or comparing him to some animal, it doesn't really make her a hypocrite. Merely laughing at someone's clothing doesn't constitute bullying in my book. Even Sue Ellen was willing to take a joke about her own sweater at first, even laughing along. 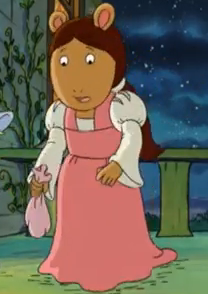 I still don't forgive her for physically threatening Arthur in "Arthur Cleans Up", though. I know, I just thought that it was a funny addition to the other reasons why the episode made no sense. Even though it's not the same thing, it's just humorous that Arthur was in such a similar situation at one time.